Immune mediators associated with human tuberculosis (TB) remain poorly defined. This study quantified levels of lung immune mediator gene expression at the time of diagnosis and during anti-TB treatment using cells obtained by induced sputum. Upon comparison to patients with other infectious lung diseases and volunteers, active pulmonary TB cases expressed significantly higher levels of mediators that counteract Th1-type and innate immunity. Despite the concomitant heightened levels of Th1-type mediators, immune activation may be rendered ineffectual by high levels of intracellular (SOCS and IRAK-M) and extracellular (IL-10 and TGF-βRII, IL-1Rn, and IDO) immune suppressive mediators. These modulators are a direct response to Mycobacterium tuberculosis as, by day 30 of anti-TB treatment, many suppressive factors declined to that of controls whereas most Th1-type and innate immune mediators rose above pretreatment levels. Challenge of human immune cells with M. tuberculosis in vitro up-regulated these immune modulators as well. The observed low levels of NO synthase-2 produced by alveolar macrophages at TB diagnosis, along with the heightened amounts of suppressive mediators, support the conclusion that M. tuberculosis actively promotes down-modulatory mediators to counteract Th1-type and innate immunity as an immunopathological strategy. Our data highlight the potential application of immune mediators as surrogate markers for TB diagnosis or treatment response. Mycobacterium tuberculosis, the etiologic agent of tuberculosis (TB),4 is estimated to infect one-third of the world’s population and annually causes ∼8 million new TB cases and >2 million deaths (1, 2). The challenge of TB is worsened by the emergence of multiple and extensively drug-resistant strains. Once infected, the majority of individuals harbor latent M. tuberculosis that persists for years or decades before the bacillus is reactivated, leading to active TB at some point in later life (2). Those with cellular immune defects are especially at risk for active TB. As such, depletion of CD4+ T cells stemming from HIV coinfection increases the risk for active TB from ∼7% life-time risk to a 10% annual risk (1). It is now clear that coordination/cooperation between the various cellular elements, especially the macrophages and T lymphocytes, are critical for the control of M. tuberculosis (reviewed in Refs. 3 and 4). However, the factors mediating active TB or latency following M. tuberculosis infection remain poorly defined. The local cytokine milieu, cellular receptors, and the transduction of receptor signals that modulate T cell and macrophage functions are thought to be important for the development of counter-M. tuberculosis immune responses (3, 4, 5, 6). In that microenvironment, IL-2, IFN-γ, IL-12, and IL-23 cytokines (reviewed in Refs. 5 and 6) are thought to play a significant role in defense against M. tuberculosis in humans, and elevated mRNA and protein levels of some of these cytokines or their effector molecules are often correlated with better anti-M. tuberculosis immune responses (7, 8). Indeed, genetic alteration in some of these cytokine receptors or receptor signal transducers is linked to increased risk for mycobacterial disease (5, 6). IFN-γ mediates its protective effect in mice predominantly by the up-regulation of macrophage NO synthase (NOS) 2, an enzyme that produces NO and is involved in the killing of tubercle bacilli (3, 4), a concept supported by unrestricted M. tuberculosis growth in IFN-γ or NOS2 gene knockout mice (3, 4). In humans, NOS2 transcripts, protein, and activity have been detected in the alveolar macrophages from active TB patients (9, 10), and NO contributes to the killing of tubercle bacilli in vitro (11). Despite the above observations, however, the preferred intracellular niche of M. tuberculosis remains the hostile phagolysosome of the alveolar macrophage (3, 4). It is postulated that the suppressed responses to M. tuberculosis Ags in active TB (12, 13) involves a suboptimal Th1-type response and ineffective macrophage activation. M. tuberculosis may avoid sterilizing immunity and promote active disease through the exploitative induction of immunosuppressive cytokines that counteract activation by IL-2 and IFN-γ. Two such deactivators of the immune response in TB are IL-10 and TGF-β, which to varying degrees inhibit T cell proliferation, differentiation, and the production of IL-2 and IFN-γ, thus antagonizing IFN-γ-mediated macrophage activation and the killing of ingested microorganisms (14, 15), as well as inhibiting early mycobacterial clearance through the attenuation of antimycobacterial immunity (16, 17). In our previous study, we reported that the bronchoalveolar lavage (BAL) cells of TB patients were significantly more likely than patients with other lung diseases (OLD) to coexpress IL-10 and TGF-β receptor type I (TGF-βRI) and receptor type II (TGF-βRII) mRNA. The BAL fluid of TB patients also contained significantly more IL-10 and bioactive TGF-β. In contrast, IFN-γ and IL-2 were seen in both TB and OLD patients (18). Intersecting studies of TGF-β and IL-10 suggest that they impair macrophage activation in part by inhibiting IFN-γ-induced NO synthesis (19, 20). These data further support the supposition that the combined production of the immunosuppressants acts to down-modulate host anti-M. tuberculosis immunity and thereby allow uncontrolled bacterial replication and overt disease. We sought additional host mediators not previously evaluated in TB patients that may act to counter protective Th1-type and innate immune response. Promotion of other extracellular suppressors such as a natural IL-1R antagonist (IL-1Rn) or IDO could limit IL-1 availability and reduce Th cell proliferation (21, 22) or inhibit Th1-type immunity and induce T cell tolerance (23, 24, 25), respectively. The clinical use of IL-1Rn for autoimmune disease treatments and the increasing levels of IDO observed in infectious and allergic diseases associated with a Th2-type bias support the possibility that both mediators may counter Th1-type immunity (21, 26, 27). Several novel intracellular mediators have recently emerged as key physiological regulators of cytokine and innate immune responses that may dampen Th1-type immunity. The suppressor of cytokine signaling (SOCS) gene family, for instance, encodes intracellular proteins that negatively regulate IFN-γ, IL-12, IL-23, and IL-6 receptor signaling and cell activation, thereby promoting a Th2-type immune bias (28, 29). Importantly, SOCS expression is promoted upon in vitro infection of macrophages by bacillus Calmette-Guérin, the TB vaccine bacillus (30). The current literature suggests that the inflammatory response of macrophages is terminated in part by several intracellular regulators, including IL receptor-associated kinase M (IRAK-M) and SOCS (28, 31, 32). IRAK-M dampens TLR signaling, resulting in decreased IL-1 and TNF-α output, as well as T cell proliferation and functional development (31, 32). In this study, we used real-time PCR to quantify the gene expression levels in lung cells from TB patients, patients with infectious OLD, and healthy volunteer healthcare workers (HCW). We analyzed whether levels of the above intracellular and extracellular immune-suppressive mediators are operating at the site of disease and whether levels of mediators that promote Th1-type immunity (IFN-γ, IL-12p35, IL-12p40, and IL-23p19) or innate immune activation (NF-κB essential modulator IκB kinase γ (NEMO), TLR 2, CD80, CD86) are reduced during active TB. We used lung cells obtained by induced sputum, because prior studies have noted a similar representation of the lung environment by sputum as by BAL samples (33, 34). Patients with suspected pulmonary TB who required induced sputum between April 1998 and June 2001 were enrolled from the Clementino Fraga Filho University Hospital of the Federal University of Rio de Janeiro (UH-FURJ), a reference hospital for TB in Rio de Janeiro, Brazil. Both the study and informed consent forms were approved by the Institutional Review Board of UH-FURJ and Weill Medical College of New York, NY. This study evaluated TB cases (n = 30) and compared them to patients with infectious OLD (n = 11) and to clinically well HCW (n = 16). All TB patients received standard anti-TB chemotherapy for 6 mo (rifampicin, isoniazid, and pyrazinamide for 2 mo followed by rifampicin and isoniazid for another 4 mo). During TB treatment, the patients were evaluated weekly for the first month and monthly thereafter. All patients were confirmed to be compliant with anti-TB treatment by pill count during each visit. At the end of therapy at 180 days, all TB patients were deemed cured of active TB. Of the 30 patients with TB, 22 were available for re-evaluation in August 2005. The mean followup for these patients was 5 years (range 4–7 years) after the end of treatment. Eight patients (code nos. 11, 13, 16, 22, 24, 26, 31, and 32) were not available for re-evaluation because they had moved. In a subgroup of these TB cases (n = 18) and healthy volunteers (= 9), the supernatants of the induced sputum were separated from the cellular elements and stored at −80°C, and cytopreps were used for human NOS2 immunolocalization. Induction of sputum was performed by inhalation of nebulized 2% saline solution (35). For TB patients, sputum was induced at diagnosis and at 15, 30, 60, and 180 days of anti-TB chemotherapy. For OLD and HCW, sputum was induced at the time of diagnosis and study enrollment, respectively. One aliquot was treated with 10% DTT (Sigma-Aldrich) for 10 min at 37°C, then centrifuged, and the supernatant was collected and stored at −70°C until required. A second aliquot, without DTT, was centrifuged and washed twice with PBS, filtrated through gauze to exclude squamous cells, and, after cell count (on average 1–2 × 106 cells) and cytoprep preparation, the cell pellet was suspended in TRIzol reagent (Invitrogen) for storage at −70°C until required. Up to 12 slides were prepared for each subject in which ∼104 cytoprep cells per well were fixed in ice cold acetone, wrapped in film, and kept at −20°C until use. Total RNA extracted from cells suspended in TRIzol reagent was analyzed by spectrophotometer (260 nm) and, in some samples, RNA integrity was confirmed by electrophoresis. One microgram of total mRNA using 50 nM oligo(dT)20 primer was reverse transcribed in a 20-μl volume using SuperScript II reverse transcriptase (Invitrogen). The cDNA samples were diluted 5-fold. Primer sequences were designed using Primer3 software (frodo.wi.mit.edu/cgi-bin/primer3/primer3_www.cgi) and synthesized by Sigma-Genosys, (Sigma-Aldrich). Most primer sets (both or at least one primer) spanned a mRNA exon-exon junction so as to restrict the amplification from any residual genomic DNA in the cDNA preparations (Table I⇓). Real-time PCR analysis used the primers shown in Table I⇓ in which each real-time PCR plate contained the following controls: GAPDH (positive), no template (negative), and DNA contamination (TNF-α intron primers). Quantification of mRNA levels was performed in an ABI Prism 7900H sequencing system (Applied Biosystems) using relative quantitative PCR SYBR Green ROX mix (Qiagen) in a 384-well optical plate. The 20-μl final volume PCR consisted of 1× QuantiTect SYBR Green, 2.5 mM MgCl2, 2 μl of diluted cDNA, and 0.3 μM each primer using the following thermocycling conditions: an initial step (95°C for 10 min) followed by 40 cycles (94°C for 45 s, 62°C for 45 s, and 72°C for 90 s) without a final elongation. To verify that the primer pair produced a single specific product, a dissociation protocol was added after thermocycling. The PCR product was also verified at least once by agarose gel electrophoresis and ethidium bromide staining to confirm the presence of a single amplicon of the correct size and also by sequence analysis (Cornell University Life Science Core Laboratories Center, New York, NY). Minimal variance between plate reactions was shown by using a single cDNA sample and GAPDH as the reference between plates. Triplicate 1:6 serial cDNA dilutions for each gene were used to generate calibration standard curves following the manufacturer’s directions for QuantiFast SYBR PCR (Qiagen). Standard curves (y = mx + b) were obtained by plotting the cycle threshold value (x) of each 6-fold dilution series vs the log2 of the dilution factor (y). The quantified target gene relative to GAPDH was calculated by the following: anti-log2 y[target gene]/anti-log2 y[GAPDH]. SDS 2.1 software was used for exporting the experimental values into a Microsoft Excel worksheet for computations and imported into Prism version 4.03 (GraphPad Software) for statistical analysis and illustration. Leukocyte-enriched buffy coats were purchased from the New York Blood Center (New York, NY) from which PBMC and monocytes were obtained by Ficoll-Hypaque density centrifugation separation protocol (Amersham Pharmacia) and Ab-mediated immunodepletion via erythrocyte rosetting (RosetteSep; Stem Cell Technologies), respectively. Duplicate wells (24-well plate) containing 2 × 106 cells were cultured and mock challenged or challenged with M. tuberculosis H37Rv previously quantified by limiting dilution and culture and stored as a stock (36). Collection of culture supernatants or cell pellets in TRIzol reagent were collected at designated times and stored at −80°C. Gene expression measurements were conducted as described above. Protein cytokines were quantified from supernatants collected from an in vitro challenge study and from induced sputum supernatants using commercial ELISA kits (Immunotech-Coulter) (18, 37). The limit of detection for IL-10 and IFN-γ are 5 pg/ml and 0.08 UI/ml, respectively. NOS2 was assessed using centrifuged cytopreps containing ∼104 lung cells stored at −20°. Immunolocalization was performed with immune alkaline phosphatase using the primary mAb, anti-human NOS2 (purified mouse monoclonal IgG1, clone 2D2-B2, 100 μg; R&D Systems), diluted to 1/40 in TBS containing BSA. Positive cells appear as red stained and the results were presented as the mean (±SEM) percentage of positive cells in which at least 100 nonsquamous lung cells were counted from at least 10 randomly selected fields. The Kruskal-Wallis test and Dunn’s posttest correction were applied to continuous variables, and Fisher’s exact test was applied for categorical variables (38) in the three group comparisons. All tests were performed using Prism 4.03 (GraphPad Software) and used to generate Fig. 1⇓, Table II⇓, and Table III⇓. A Wilcoxon sign rank test was used for comparing the duration of symptoms between TB and OLD patients (e.g., two group comparisons) (Table II⇓). Six of the 17 mediators for Fig. 1⇓ and three of the 17 mediators for Table III⇓ had some individuals whose numerical values were very low compared with other individuals. We interpreted ≤0.001 copies relative to GAPDH to indicate a very low value, because this translates as gene copies 1000-fold lower than those of GAPDH, a constitutively expressed gene. For these mediators, values in each group were segregated as ≤0.001 or >0.001 copies relative to GAPDH and analyzed as categorical data by Fisher’s exact test. Such cases are indicated by ** in Fig. 1⇓. To compare group differences using median values in Fig. 3⇓, three different methods, ANOVA, generalized estimating equation (GEE), and mixed model were used (39, 40). GEE and mixed model account for the nature of repeated measures, whereas ANOVA does not. To the best of our knowledge, there is no statistical method that can account for severe non-normality and the aspect for longitudinal data. Therefore, although limited, we decided to use three standard analytic methods for testing group differences to ascertain the robustness of the results. In these analyses, we did not correct for multiple testing for each analysis that entails a different threshold. A stricter threshold for interpreting p values can be used based on the Bonferroni’s method that adopts 0.05 divided by the number of hypotheses or comparisons. For example, p = 0.005 was used when 10 comparisons were made. Lung immune response of TB cases, patients with OLD, and HCW. Illustrated are the mRNA expression levels in log10 scale of the lung cells from patients with TB, patients with infectious OLD, and clinically well HCW quantified by real-time PCR relative to GADPH. The scale of the horizontal axis for gene expression relative to GAPDH for each mediator was set to illustrate the lowest to the highest recorded levels. Linear bars represent the median of the group. The findings were segregated by mediators that impair Th1-type immunity (A), promote Th1-type immunity (B), or affect both Th1-type or Th2-type cells (C). Each symbol represents the value of one subject and the triangles designate HIV-1-coinfected patients. The two asterisks (∗∗) alongside the name of the gene indicate a significant difference between TB cases and OLD and HCW was observed (Kruskal-Wallis or Fishers’ exact test). The p values for the comparison between groups are shown below the horizontal axis. A *P indicates that Fishers’ exact test was used for six of the 17 genes (see Materials and Methods). We evaluated TB cases (n = 30) and compared them to patients with infectious OLD (n = 11) and clinically well HCW (n = 16). Bacteriologically proven TB cases (n = 28) were defined by compatible clinical and chest x-ray findings of infiltrates and/or cavitation and a positive M. tuberculosis culture (n = 25) or acid-fast bacilli smear (n = 3). Clinical TB cases (n = 2) had compatible clinical and chest x-ray parameters but lacked bacteriologically positive results. All TB patients received standard anti-TB chemotherapy for 6 mo (see Materials and Methods). At the end of therapy (day 180), all TB patients were deemed cured of active TB based on the resolution of clinical signs and symptoms and radiological infiltrates or cavitation. Four patients (code nos. 12, 13, 14, and 23) were diagnosed with HIV-1 coinfection while under anti-TB treatment or after the completion of treatment. As there was a delay in consent for HIV testing, none of the HIV/AIDS patients were on antiretroviral therapy at the time of diagnosis or during the early phase of anti-TB treatment. CD4 T cell counts were available for two patients (patient 14 was 344 μl−1 at 6 mo after completion of TB treatment, and patient 12 was 707 μl−1 6 years after completion of anti-TB treatment and had then suffered a second episode of TB). Patients in whom TB was excluded by culture and clinical assessment served as controls with infectious OLD. All patients with infectious OLD (n = 11) had negative acid-fast bacilli smears, and mycobacterial cultures and were diagnosed with community-acquired bacterial pneumonia (n = 9; chest x-ray findings resolved after treatment with a nonquinolone antibiotic), paracoccidiomycosis pneumonia (n = 1; sputum-stained smear suggestive of Paracoccidioides braziliensis and clinical response to antifungal therapy), or community-acquired viral respiratory infection (n = 1; clinical symptoms and chest x-ray findings resolved without antimicrobial treatment). In addition, clinically well HCW (n = 16) were recruited from the UH-FURJ, half of whom were positive for the tuberculin skin test. Illustrated in Table II⇑ are the patient characteristics of the cohort. TB patients tended to be significantly younger than patients with OLD, but older than HCW. A slightly greater male to female ratio was noted in TB patients, which is similar to the ratio noted in the national data (from 2005) for Rio de Janeiro and Brazil from the Health Surveillance Secretariat of the Brazilian Ministry of Health (portal.saude.gov.br/portal/arquivos/pdf/epidemio.pdf). There was no tobacco use by HCW; however, a greater proportion of TB cases smoked cigarettes than patients with OLD. By chest x-ray, TB cases manifested more extensive lung involvement, as indicated by only TB cases having cavitary disease and a greater proportion presenting with disease in more than one lobe. The analysis of the cytospin cell preparation at the time of diagnosis showed that the major cell type was macrophage. The differences in cell types between patients with TB and OLD or with HCW showed a slightly greater percentage of macrophages and lymphocytes for TB cases, resulting in a lower percentage of neutrophils. Eosinophil cell counts were similar in all three groups. The percentages of various cell types noted in TB cases, patients with infectious OLD, and HCW were similar to our prior reported findings using BAL cells (18). The expression of immune mediators in cells harvested from the induced sputum of TB and OLD patients at the time of diagnosis and in HCW was evaluated after reverse transcription of the mRNA. Real-time PCR was performed and quantified using a standard curve method relative to the GAPDH reference gene. Fig. 1⇑ illustrates the expression levels of immune mediators at the initial diagnosis. Mediators are separated into three groups: 1) those that are known to impair Th1-type immunity (IL-10, TGF-βRI, TGF-βRII, IRAK-M, SOCS1, SOCS3, IL-1Rn, and IDO; Fig. 1⇑A); 2) those that promote Th1-type immunity (IFN-γ, IL-12p35, IL-12p40, IL-23p19, TNF-α, and NEMO; Fig. 1⇑B); and 3) those that affect both Th1 and Th2 immunity (CD80, CD86, and TLR2; Fig. 1⇑C). Overall, of the 17 illustrated immune mediators, 13 were at significantly higher levels in TB cases when compared with patients with OLD, and 14 were higher when compared with HCW (p ≤ 0.05; Kruskal-Wallis test or Fishers’ exact test). These data demonstrate that TB cases express significantly higher levels of mediators with anti-inflammatory activity and/or mediators that may impair Th1 immunity (IL-10, TGF-βRII, IRAK-M, IL-1Rn, SOCS1, SOCS3, and IDO) when compared with the control groups (patients with OLD and HCW) (Fig. 1⇑A). TB cases were also found to express higher levels of mediators that promote Th1-type immunity (IFN-γ, IL-12p40, IL-12p35, and NEMO) when compared with the control groups (Fig. 1⇑B). TNF-α levels in TB cases were similar to those of controls. Therefore, the functional effects of proinflammation appear to be more sustained in TB cases than for either comparison group. 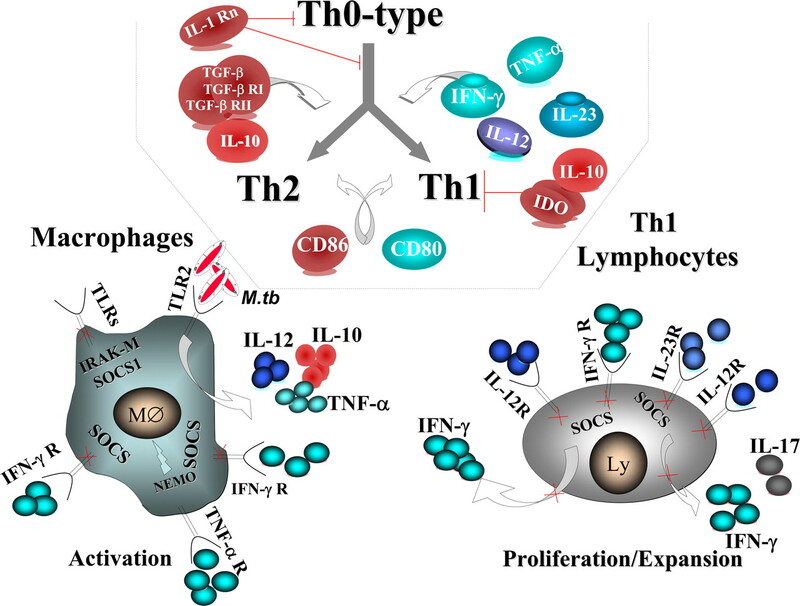 Of the molecules that may promote both Th1-type and Th2-type immunity (Fig. 1⇑C), TLR2 levels were significantly higher in TB cases whereas the CD86 costimulatory molecule levels were significantly lower compared with the control groups. CD80 costimulatory molecule levels were similar in all three groups. We next evaluated the lung gene expression of each mediator at the initial diagnosis and in response to anti-TB drug treatment to test the hypothesis that anti-TB treatment modified gene expression (Fig. 2⇓). No obvious trend was observed during treatment, likely because of the variability in range between patients. To evaluate for potential temporal trends, we transformed the mediator values into fold change for each patient during anti-TB treatment by dividing the quantified mediator value at days 15, 30, 60, and 180 of anti-TB treatment by the pretreatment value (day 0). After data transformation and plotting of the median value for each mediator in TB cases, three patterns could be grouped by the fold change in mRNA expression on day 15 of anti-TB treatment: ≥2-fold decreased (Fig. 3⇓A), <2-fold change (Fig. 3⇓B), and ≥2-fold increased above pretreatment value (Fig. 3⇓C). The application of a 2-fold difference in gene expression is in accordance with the convention used for microarrays, which presumes that a 2-fold gene expression difference has a biological impact. Of note, mediators that impair Th1-type immunity either declined by ≥2-fold (TGF-βRII, SOCS3, IL1Rn, and IDO; range, 3- to ∼1000-fold) or showed a declining trend as in the case of IL-10 and IRAK-M but changed by <2-fold. In contrast, mediators that promote Th1-type immunity increased by ≥2-fold (Fig. 3⇓C) during anti-TB treatment (IFN-γ, IL-12p40, IL-12p35, NEMO, and TLR2; range, 3- to 14-fold). The distinct temporal changes in response to anti-TB drug treatment compared with initial pretreatment lend further support that these lung mediators are specific to TB. We next applied three statistical methods to analyze the patients’ fold change values for each mediator represented in Fig. 3⇓ as median mediator values to determine whether the noted variances were significantly different. The fold change comparison between mediators in A and C of Fig. 3⇓ by three methods without slope or curve fitting supported the assertion that variances between mediators were significantly different (Fig. 3⇓, A vs C, p = 0.0001 by ANOVA; p = 0.002 by GEE; and p = 0.0002 by mixed model). The lung immune response of TB patients at the time of diagnosis and during anti-TB treatment. During anti-TB therapy at days 15, 30, 60, and 180, mediator gene expression by lung cells from patients with active TB were quantified by real-time PCR. The findings are segregated as mediators of genes that impair Th1-type immunity (A), promote Th1-type immunity (B), or are variable in countering effects (C). Of note, the levels of mediators quantified for the four HIV-coinfected TB patients (triangles and dots) were not distinguishable from the other TB cases. Patterns of lung mediator gene expression by cells from TB cases during anti-TB treatment. To test the hypothesis that anti-TB treatment modified gene expression, the pattern of gene expression during anti-TB was evaluated relative to the pretreatment value. The gene expression fold change for each mediator was derived by dividing each time point’s monitored value for each patient during anti-TB treatment (Fig. 2) by the pretreatment amount (Fig. 1). The median value for each mediator was plotted, and three groups could be segregated based on the fold change in mRNA expression at day 15 of anti-TB treatment: declined ≥2-fold (A), changed by <2-fold (B), or increased by ≥2-fold (C). To investigate whether anti-TB drug treatment was associated with the normalization of lung mediators, the quantified values of each mediator relative to GAPDH, assayed for TB cases during treatment at 15, 30, 60, and 180 days (Fig. 2⇑), were compared with control groups (HCW and OLD; Fig. 1⇑). Of the 14 mediators that were at significantly greater levels in TB cases at the time of diagnosis compared with those in HCW (Fig. 1⇑), seven declined during anti-TB drug treatment to levels similar to those in HCW. The remaining seven mediators did not normalize. Five of the seven mediators (IL-12p35, IL-12p40, TLR2, NEMO, and IFN-γ) that promote Th1-type immunity rose >2-fold in response to anti-TB treatment (Fig. 3⇑) and sustained the heightened levels throughout treatment when compared with patients with OLD and HCW (Table III⇑). 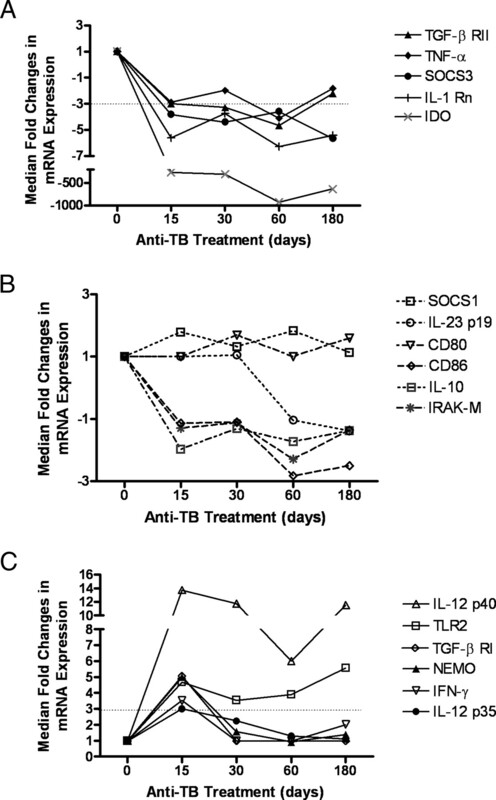 The remaining two mediators, SOCS1 and IRAK-M, which impair macrophage activation by IFN-γ or the sensing of M. tuberculosis ligands by TLRs, respectively, remained persistently elevated even at the end of treatment with anti-TB drugs at levels that were significantly greater than those in OLD and HCW (Table III⇑). These selective changes in immune mediator expression levels in response to anti-TB drug treatment provide additional support that the observed findings could be directly attributable to M. tuberculosis infection. The interplay of genes with down-modulatory function and those that promote Th1-type activity is illustrated in Fig. 4⇓. The consequence of a heightened down-modulatory immune response that impairs Th1-type activity may therefore be the uncontrolled proliferation of M. tuberculosis and active TB. Schematic illustrating the down-modulated lung immune state associated with TB. Based on the findings of this study, a working model of the immunopathological mechanisms associated with TB is presented. The symbol (×) indicates a blockade of a pathway or function. Our findings suggest that M. tuberculosis triggered the in vivo expression of the measured immune genes. To validate that these immunomodulatory genes are a direct consequence of challenge by M. tuberculosis, in vitro experiments using naive human PBMC and monocytes were conducted. As illustrated in Fig. 5⇓, the expression of a similar set of immunomodulatory genes as that detected in lung cells obtained by induced sputum during active TB was also up-regulated in monocytes (Fig. 5⇓A) and PBMCs (Fig. 5⇓B) after direct in vitro challenge with M. tuberculosis. Furthermore, TNF-α and IL-10, but not IFN-γ, protein levels were also shown to be greatly induced in human monocytes (Fig. 6⇓A) and PBMC (Fig. 6⇓B), thereby confirming that up-regulation of gene expression is accompanied by protein production. To further confirm that the genes up-regulated by cells obtained from induced sputum were similarly translated into proteins, a subset of the cohort with available induced sputum supernatant was evaluated by ELISA for the presence of IL-10 and IFN-γ. Clearly, control healthy volunteers (VOL in Fig. 7⇓) do not manifest significant changes in levels of IL-10 and IFN-γ at entry (time 0) compared with 15 days later (Fig. 7⇓, A and B, respectively). Healthy volunteers also produced significantly lower levels of IL-10 and IFN-γ at entry than TB cases (p < 0.05). In contrast, the IL-10 and IFN-γ quantified for TB patients were both elevated at study entry (time 0) and showed a decreasing trend during the course of TB treatment. The decline was most apparent for the mean IL-10 level shown for the entire cohort of TB cases (Fig. 7⇓C). We next evaluated the expression of inducible NOS by alveolar macrophages as an indicator of the in situ lung’s state of antimicrobicidal activity. Importantly, all healthy volunteers had cells expressing NO2, such that >60% of visualized alveolar macrophages expressed NO2. In contrast, 13 of 15 TB patients studied had NOS2 detected in their alveolar macrophages at the time of TB diagnosis with a mean number of cells expressing inducible NOS of <30% (Fig. 8⇓ and illustrated in supplemental Fig. 1).5 The lower number of NOS2 expressing alveolar macrophages in TB cases compared with volunteers (>60%) underscores the overall immune down-modulated state of the lung during active TB. The decline in the percentage of NOS2-positive alveolar macrophages and number of patients with NOS2-positive cells detected during anti-TB drug treatment further support the assertion that NOS2 expression is in response to M. tuberculosis (Fig. 8⇓B). Gene expression profile of immune modulators following in vitro challenge with M. tuberculosis (M.tb). Immune modulators previously studied in lung cells were evaluated in vitro following challenge with M. tuberculosis H37Rv. Gene expression relative to GAPDH for monocytes (>95% CD14 positive) (A) and PBMC (B) were quantified at designated times after challenge with M. tuberculosis. Illustrated is one representative of two experiments; each condition was tested in duplicate. Protein levels of select immune modulators following in vitro challenge with M. tuberculosis (M.tb). In experiments parallel to that of the in vitro gene expression study, cell culture supernatant from monocytes (A) and PBMC (B) at the designated times following challenge with M. tuberculosis H37Rv were harvested after cell depletion and TNF-α, IL-10, and IFN-γ were measured. Illustrated is one representative experiment of three. Levels of cytokines in induced sputum supernatants. A and B, Illustrated are the mean (+SEM) IL-10 (A) and IFN-γ (B) levels. Comparisons between IL-10 and IFN-γ levels in TB cases and healthy volunteers (VOL) at times (T) 0 and 15 were statistically different (∗, p < 0.05; Mann-Whitney U test). C and D, Illustrated are the individual and median (horizontal bar) IL-10 (C) and IFN-γ (D) levels quantified in induced sputum for each TB case at diagnosis and during anti-TB treatment. IL-10 levels showed a decreasing trend until 60 days of anti-TB treatment, paralleling the bacilli clearance; however, the trend was not statistically significant (Student’s t test for repeated measures). Expression of human NOS2 by lung cells. A, Comparisons of NOS2 levels between those in TB patients and healthy volunteers (VOL) are illustrated as the mean (+SEM) percentage of positive cells (alveolar macrophages) obtained at diagnosis (time (T) 0) and at day 15 of anti-TB treatment. Statistically significant differences in NOS2 levels were noted between those TB patients and the healthy volunteers (∗, p < 0.05; Mann-Whitney U test). B, Mean NOS2 levels quantified from TB cases at time of diagnosis to 180 days are illustrated. Of the 15 TB cases studies, the number of patients with positive NOS2 lung cells at time of diagnosis (T0) and during anti-TB treatment (days 15, 30, 60, and 180), respectively, were 13, 10, 5, 6, and 3. All of the nine healthy volunteers had NOS2 detected. Statistical differences in the expressions of NOS2 at different times during anti-TB treatment are shown (∗, p < 0.0; Student’s t test for repeated measures). To discern whether the levels of immune mediators correlate with distinct clinical manifestations or a second episode TB, the patients’ study numbers were relinked with the patients’ records for disease severity (n = 30) and second episode TB (n = 20). We found the following associations in TB cases (Wilcoxon rank sum, p < 0.05; Table IV⇓): 1) cavitation disease associated with higher levels of IL-23 and lower levels of IRAK-M; 2) disease affecting more than one lobe associated with higher levels of SOCS3; and 3) acquisition of second episode TB associated with lower levels of NEMO and higher levels of CD80. It is important to note that these associations, with the exception of IL-23, were found at only one time point and therefore could be due to chance. Progression to active TB in humans is mediated by a combination of poorly understood microbial and host factors that are the focus of active investigation. Most studies have relied on murine models (3, 4), in vitro M. tuberculosis Ag-rechallenged ex vivo human BAL cells, peripheral blood from TB patients and their contacts (41, 42), or BAL cells from patients with TB pleurisy (42). Few studies have comprehensively evaluated the immune profiles of lung cells from active TB patients during treatment (8). In our previous study using BAL samples from bacteriologically proven TB cases, TB cases compared with patients with infectious OLD and healthy volunteers produced significantly higher levels of IL-2 and IFN-γ (18). Concomitant overexpression of IL-10 and TGF-βRI and TGF-βRII, as well as bioactive TGF-β, led us to posit that M. tuberculosis products actively promote a down-modulatory immune response to dampen host anti-M. tuberculosis immunity and thereby allow uncontrolled bacterial replication and overt disease (18, 36). In the current study, we used cells obtained from induced sputum to further delineate the immune response in the lung during active pulmonary TB. The sensitivity of induced sputum for TB diagnosis is comparable to that of BAL (35). Likewise, the results of lung immune responses were similar in most studies when samples obtained from induced sputum or BAL were used (33, 34). The percentages of cell types obtained by induced sputum in the current study also appeared similar to those in our previous study using BAL cells (18). In addition, we previously observed that levels of IL-10 protein in induced sputum samples of pulmonary TB patients positively correlated with the amount of CFP32, a M. tuberculosis Ag, indicating that IL-10 levels correlate with the failure of immune control M. tuberculosis (37). In the current study, using lung cells from induced sputum we confirmed and further extended our prior results (18, 37); TB cases expressed significantly higher levels of mediators associated with Th1-like immunity (IFN-γ, IL-12p35, IL-12p40, and NEMO) compared with patients with OLD or with clinically well HCW. Our observations are supported by other studies that measured IFN-γ, TNF-α, or IL-12 (41, 43) and by microarray evaluation of BAL cells from TB patients (8, 44). However, immunity in TB patients remains suboptimally oriented, and so, despite the presence of proinflammatory signals, competing anti-inflammatory signals must predominate. Indeed, coincident with the higher expression of Th1-like mediators, TB patients also expressed significantly higher levels of IL-10, TGF-βRI, TGF-βRII, IL-1Rn, and IDO than patients infected with OLD and HCW. These findings are in agreement with our prior study using BAL cells and with microarray analysis of lung cells from BAL that showed increased expression of TGF-β or a comparable Th2 presence (8, 44). In addition to TGF-β and IL-10, we report herein that the extracellular suppressors IL-1Rn and IDO and the potent intracellular negative regulators IRAK-M and the SOCS family members were significantly elevated in TB cases and likely serve to impair innate as well as Th1-type immunity. This may be one of the first human studies to demonstrate that SOCS1, SOCS3, IRAK-M, IL-1Rn, and IDO are overexpressed by the lung cells of patients with active pulmonary TB as compared with patients with infectious OLD. Our current observations conceptually parallel the findings by Raju et al. (8) even though the mediators classified as Th1 or Th2 by that study were not examined by our study, and many of mediators uncovered by this report were not detected by Raju et al. as being up-regulated in TB patients. Potential explanations that account for the differences in our current findings may include the fact that different methods were used and that Raju et al. sampled BAL (predominately containing macrophages) whereas we sampled induced sputum that contains several cellular immune elements (Table II⇑). Fig. 4⇑ illustrates both the permissive and the immune suppressive lung environments observed in the present findings that allow the uncontrolled proliferation of M. tuberculosis in active TB. The pattern of gene expression noted in patients’ lung cells was similarly found upon in vitro challenge of PBMC and monocytes with M. tuberculosis (Fig. 5⇑). Moreover, the translation of these genes into proteins that effect their function were confirmed by the measurement of a limited number of these immune modulators in vitro and in induced sputum samples (Figs. 6–8⇑⇑⇑). Even though the macrophage was the major cell type, we detected lymphocytes at ∼1%. Therefore, the model includes both cell types in interpreting the data with the following caveats. It should be recognized that regulatory T cells may be more important in the production of Th2-type pulmonary responses in humans rather than the canonical Th2 cells as seen in murine studies. Secondly, we do not know whether the illustrated innate Th lung environment reflects the immune education that typically occurs in a lymphoid compartment. Furthermore, neutrophils in the sample may indicate the contribution of airway cells in addition to that from the alveolar space. However, in our previous study using lung cells obtained by BAL, neutrophils were also noted in samples from TB cases (18). Therefore, this finding may reflect the lung environment in “early” TB and/or the fact that TB involves not only the alveoli but is a granulomatous process that encompasses alveoli and airways. The upper panel of Fig. 4⇑ illustrates the heightened expression of IL-10, TGF-β ligand, TGF-βRI, TGF-βRII, IL-1Rn, and IDO in the lung cells of TB cases that act in concert to minimize Th0-type cell development into Th1-type cells while promoting the expansion of Th2-type cells despite the concomitantly expression of mediators that promote Th1-type immunity (IFN-γ and IL-12). Overproduction of IL-10 has been reported to impair Th1-type cell development/function and promote the expansion of Th2-type cells (12, 15, 45, 46). The fact that IL-10 may also underlie the susceptibility of certain mouse strains to mycobacterial infection (47) and that the alleles of IL-10 in humans are linked to susceptibility to TB point to the contribution of IL-10 to TB disease (5). A similar outcome may be expected with the overexpression of the TGF-β ligand and receptors, because they have been reported to contribute to a shift toward a Th2-type response (14, 46, 48, 49). Sustained secretion of IL-10 and TGF-β has been reported to result in a long-lasting hyporesponsive (anergic) state to specific Ags (45, 46) and is likely in play because PBMC from pulmonary TB patients manifest bioresponses similar to those induced by IL-10 and/or TGF-β (12, 48, 50, 51). The increased levels of serum IL-10 and TGF-β detected in TB patients, and the increased in vitro IL-10 and TGF-β secretion by the PBMC and/or monocytes of TB patients in response to M. tuberculosis Ags, also support a role for these two immune suppressive mediators (7, 52, 53, 54). The fact that M. tuberculosis can directly induce macrophage IL-10 and TGF-β production (36, 55) and that the growth restriction of M. tuberculosis by human monocytes/macrophages is correlated inversely with the amount of stimulated IL-10 and TGF-β secretion (36, 56) further underscores their antagonistic role in microbicidal activity in TB. High amounts of IL-1Rn may impair Th0 development into Th1 cells, because IL-1 promotes Th1-type-mediated inflammation under several clinical conditions (21, 22). In an experimental arthritis model IL-1Rn-null mice had a prominent Th1-type immunity with exaggerated IL-23, IL-17, and IL-23 blockade (with anti-p19 mAb) abolished the IL-17 production induced by IL-1 and decreased disease severity (57). Another study showed that immune responses to liparabinomannan, the M. tuberculosis cell wall component, appeared to be mediated by IL-1 activity, because IL-1R null mice showed significantly reduced cell recruitment into the lung, as well as lower levels of TNF-α in the lung (58). Lastly, alleles of the IL-1Rn gene have been associated with susceptibility to mycobacterial infection (5, 6). Our current data suggest that IDO overexpression may favor Th2-type immunity through the depletion of the tryptophan needed by Th1-type cells or via the deletion of Th1 cells by kynurenines, toxic metabolites resulting from IDO catabolism of tryptophan (23, 24). In addition to the finding that in vitro infection by intracellular Toxoplasma, Leishmania, and M. tuberculosis induced macrophages and/or dendritic cells to express IDO (24, 59), enhanced IDO expression has been implicated in the pathogenesis of influenza and West Nile virus infection (26, 27). As such, following influenza infection and treatment with an IDO inhibitor, mice showed reduced bacterial load and, thus, less severe secondary pneumococcal pneumonia (26, 27). CD80 and CD86 costimulatory molecules have been reported to direct Th1 and Th2 responses, respectively; however, the effects of CD80 and CD86 on Th0 cell development are likely more complex (60). Depending on the temporal sequence of immune events and level of expression, CD86, may bias either a Th1 or Th2 response (61, 62). 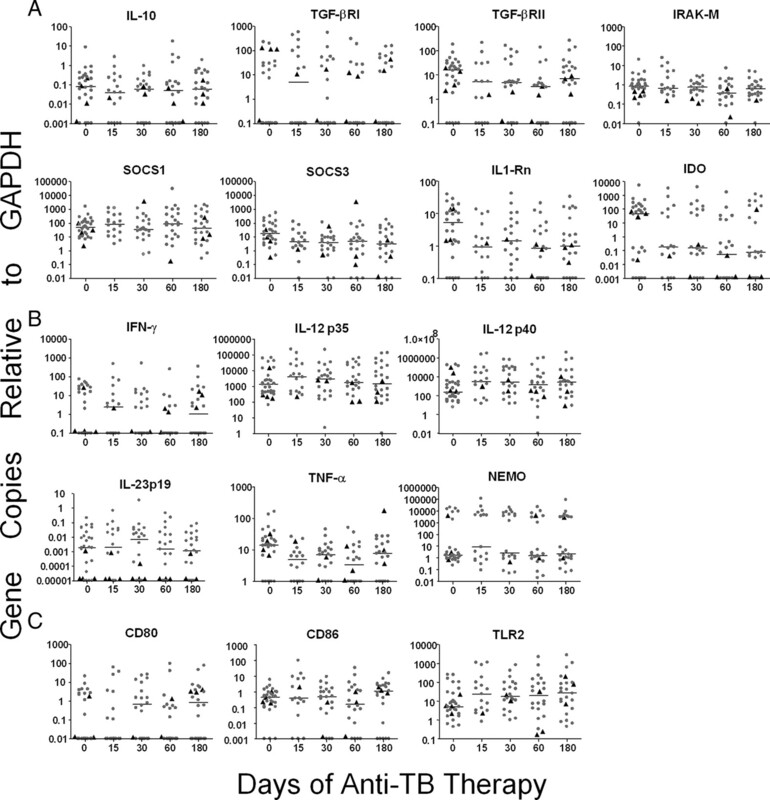 In this study, we noted that levels of CD80 in TB cases were similar to those in two control groups, whereas the levels of CD86 were significantly lower in TB cases than in controls Our findings may therefore suggest that, in sum, similar CD80 levels in the context of lower CD86 in TB may promote a biased Th2-type immunity. The two lower panels of Fig. 4⇑ illustrate the effect of SOCS1 and SOCS3 overexpression. This schematic of the overexpression of SOCS provides new insight into why, despite heightened levels of Th1-type mediators (at levels that were higher than those in patients with infectious OLD), the lung environment in active TB cases is permissive for M. tuberculosis proliferation. Heightened expression of SOCS1 and SOCS3 in human TB shown by this study is supported by findings from three prior reports: 1) in vitro infection of murine macrophages by the TB vaccine bacillus Calmette-Guérin is associated with increased SOCS1 expression (30); 2) SOCS1, SOCS4, and SOCS5 are preferentially up-regulated in the lungs of mice infected with W/Beijing M. tuberculosis (63); and 3) SOCS3 is up-regulated in human macrophages and dendritic cells after in vitro infection by M. tuberculosis (59). The lower right panel of Fig. 4⇑ illustrates SOCS1 and SOCS3 functioning to interrupt one or more steps of the cell signaling cascade initiated by IFN-γ, IL-12, and IL-23 binding to their cognate receptors (28, 29, 64). The sum effect of the overexpression of SOCS genes could be limited proliferation and expansion of Th1 cells, less responsiveness to Th1-type cytokines, and, in turn, less production of Th1-type cytokines. Supporting this concept is our finding that, subsequent to treatment with anti-TB drugs (and killing of the tubercle bacilli), lung cells from TB cases produced greater amounts of IFN-γ (a Th1-type cytokine) than were produced pretreatment (Fig. 3⇑C and Table III⇑). Lastly, overexpression of SOCS3 in Th2-type cells also regulates the onset and maintenance of Th2-mediated allergic responses and may promote Th2 activity in TB (65). As illustrated for macrophages (Fig. 4⇑, left bottom panel), the increase in SOCS1 may dampen cell activation by IFN-γ and minimize antimycobacterial activity, thereby permitting uncontrolled M. tuberculosis proliferation (28, 29, 64). Current data also suggest that participation by SOCS1 in the negative regulation of TLR signaling dampens antimycobactericidal activity (28, 64). 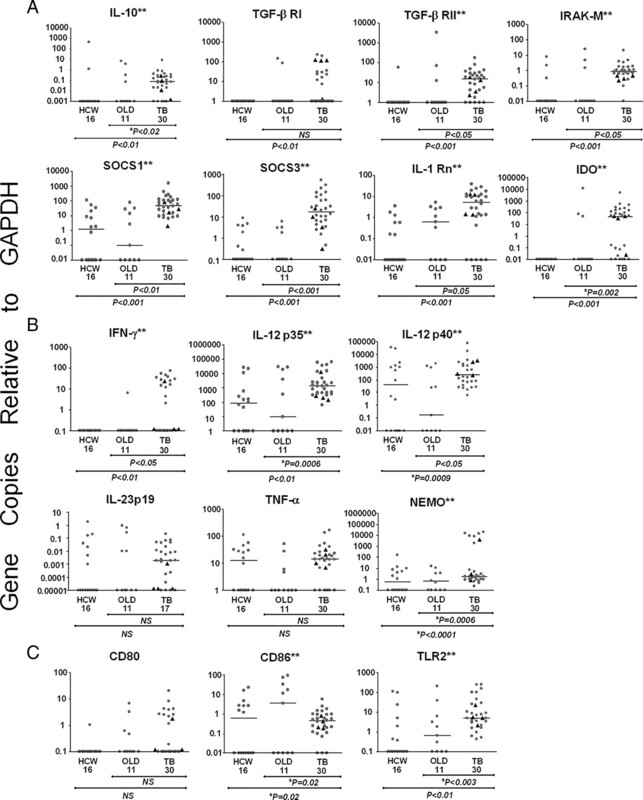 Another consequence of the overexpression of SOCS1 in lung macrophages is an impaired capacity to promote Th1-type immunity, because enhanced SOCS1 expression by innate immune cells has been reported to inhibit the acquisition of CD4 and CD8 T cell adaptive immunity against a viral agent (66). Consistent with this interpretation is our finding that levels of IL-23p19 in TB cases at the time of diagnosis were as low as those in HCW and in patients with OLD. Because IL-23p19 is an output of innate immune cells induced by IFN-γ, this finding along with uncontrolled M. tuberculosis proliferation supports our hypothesis that lung macrophage activation by IFN-γ is functionally impaired. Macrophages also respond to IFN-γ to enhance its antimicrobicidal activity as a consequence of NOS2 expression. Our finding that <30% of alveolar macrophages expressed NOS2 at TB diagnosis supports the notion that a lower state of antimicrobicidal activity exists in the lung during active TB (Fig. 8⇑). The overexpression of IRAK-M in TB cases may also counter maximal macrophage activation by pathogen-associated molecular patterns of M. tuberculosis. IRAK-M normally functions as a negative regulator of TLR signaling after the ligation of TLR with its cognate microbial ligand (31, 32). The heightened expression of IRAK-M in TB may therefore act to dampen the sensing of mycobacterial ligands by TLR family members, in particular the TLR2, TLR4, and TLR9 receptors that have a putative role in the control of M. tuberculosis (67, 68, 69, 70). Our finding that IRAK-M is overexpressed provides another line of data to explain why, despite M. tuberculosis cell wall components being highly inflammatory (as shown by Freund’s adjuvant), macrophages lack antimycobacterial activity to control M. tuberculosis. TLR2 is also overexpressed in TB cases. Increased TLR2 expression may provide M. tuberculosis another avenue to exploit immune subversion, because many M. tuberculosis ligands detected by innate immune cells are apparently sensed by TLR2. These include lipoproteins and the ESAT-6 protein, each of which has been shown to impair immune activation and/or favor the production of more antiinflammatory than inflammatory cytokines (36, 71, 72, 73). Through a systematic comparison of innate immune responses after cell stimulation with agonists specific for TLR2, TLR3, TLR4, TLR5 and TLR7, Re and Strominger found that TLR2 stimulation led to the blockage of subsequent cell activation by TLR3 and TLR4 agonists (74). Moreover, cell activation via TLR2 resulted in the rapid release of IL-10 that inhibited IP-10 and IL-12p35 induction (74). In light of these in vitro findings, we speculate that the preferential signaling via TLR2 in active TB results in a net anti-inflammatory effect that functionally deactivates macrophages harboring M. tuberculosis and thus allows unrestricted proliferation and overt disease. The notion that M. tuberculosis-mediated TLR2 signaling is anti-inflammatory was previously posited by Salgame et al. (73, 75). The consequence of heightened expression of SOCS1, IRAK-M, and TLR2 as well as potent soluble suppressors of macrophage activation such as IL-10 and TGF-β may result in lower antimicrobicidal activity, as shown by <30% of alveolar macrophages expressing NOS2 (Fig. 8⇑). The temporal changes in the lung mediators in response to anti-TB treatment further supports our hypothesis that M. tuberculosis is modulating these factors (Fig. 3⇑ and Table III⇑). Specifically, we noted that Th1-type immune modulators as a whole increased by >2-fold (range, 3- to 14-fold) after 15 or more days of anti-TB treatment, whereas the majority (four of seven) of mediators that impair Th1-type immunity declined by >2-fold (range, 3- to 1000-fold). Statistical comparison of mediator levels during anti-TB treatment compared with those in patients with OLD and HCW strengthens our claim that these factors are indeed responding to M. tuberculosis (Table III⇑). The majority of mediators that impair Th1-type immunity declined to levels that were comparable with those in patients with OLD and HCW. In contrast, mediators that promote Th1-type immunity rose and remained at significantly higher levels than those in patients with OLD and HCW even at the end of anti-TB treatment at 180 days. Our preferred interpretation regarding changes in modulator expression in response to anti-TB drugs is that the removal of M. tuberculosis led to immune improvement. However, we have not excluded the possibility that changes in cellular constituents may also contribute to our findings. Our finding that in vitro challenge of PBMC and monocytes elicited the heightened expression of a similar panel of immunomodulatory genes favors the former interpretation. Lastly, the decline in the percentage of alveolar macrophages expressing NOS2, a potent microbicidal effector, further support the assertion that these genes are responding to the presence of M. tuberculosis and that the killing by anti-TB drugs led to diminishing expression of these genes during treatment (Fig. 8⇑). We also noted in this study that despite the completion of anti-TB treatment, the levels of expression of SOCS1 and IRAK-M (the intracellular suppressors of TLR and IFN-γR signaling, respectively) as well as that of TLR2 remained elevated compared with that of HCW even though all TB patients were cured (based on clinical and radiological evidence). The residual heightened presence of these intracellular negative regulators of innate immunity and cellular activation may reflect continued lung repair, modulation by residual M. tuberculosis Ags, and/or dormant bacilli. Persistence of a down-modulatory state may increase the risk for new infection by another strain of M. tuberculosis. A similar immune-suppressed state has been shown subsequent to infection by influenza and the measles virus (26, 76, 77) and results in increased risk for bacterial pneumonia. Recently, Verver et al. observed a 7-fold higher risk for subsequent TB in those successfully treated for TB (78), which led the authors to speculate that M. tuberculosis modified the lung environment to be permissive for reinfection. Our findings provide the immunological data supporting this premise. Several of the mediators in this study were associated with either cavitary, more extensive disease, or the acquisition of second episode TB (Table IV⇑). These preliminary findings were presented solely to illustrate that certain lung immune mediators, when studied in a prospective patient cohort with a sufficient sample size, may potentially provide additional insights into TB disease and recurrence; this approach is supported by a previous report noting that the levels of circulating Th1 and Th2 cytokines correlated with the severity of clinical disease (7). In summary, our findings in active TB suggest that M. tuberculosis promotes down-modulatory lung immune mediators to counteract Th1-type and innate immunity as an immunopathological strategy. The temporal changes in certain immune factors during anti-TB treatment substantiate the contention that these mediators are modulated by M. tuberculosis to transit to active disease. Differences in the level of expression of lung immune mediators between TB cases and patients with infectious OLD and HCW and in their temporal change in response to anti-TB therapy suggest that certain mediators have the potential to be surrogate markers for TB diagnosis and treatment response. Surrogate markers are critically needed to monitor treatment response to anti-TB drugs, especially in resource-poor settings that lack the personnel and/or facilities to perform mycobacterial culture (79, 80). Moreover, having surrogate markers will facilitate large multicenter clinical trials for new anti-TB drugs in regions of high TB incidence that coincidentally are also resource poor. We recognize that real-time PCR is not practical in resource-poor regions, but ELISA-based assays have the potential to be made affordable, rapid, and sensitive. In a proof of concept, we used Ag capture ELISA to diagnose TB by the presence of a M. tuberculosis protein, CFP32, in induced sputum that positively correlated with IL-10 levels (37). Prospective cohorts with sufficiently large sample sizes and segregated by M. tuberculosis strain family are needed to confirm our findings that host proteins can be used as surrogate markers for TB diagnosis and treatment response, especially in the setting of emerging multidrug-resistant and extensively drug resistant TB. We are grateful to Warren D. Johnson Jr. for supporting this study. ↵1 Funding for this study was provided by National Institutes of Health (NIH) Grants R01 HL61960, R21 AI063147, and R21 AI063147 (to J.L.H. ), NIH Fogarty International Center Training Grant (FICTG) D43 TW00018 under the AIDS International Training and Research Program (to Warren D. Johnson and J.L.H. ), ICOHRTA AIDS/TB 5 U2R TW006883 (to J.R.L.e.S. ), and grants from the Coordenação de Aperfeicoamento de Pessoal de Nivel Superior, Ministry of Education-Brazil, the Brazilian Research Council/Conselho Nacional de Desenvolvimento Científico e Tecnológico (CNPq), the Brazilian Research Council/World Bank Millennium Institute of Science, Programa de Apoio a Núcleos de Excelência (to J.R.L.e.S. and A.L.K. ), and the Laura Cook Hull Trust Fund (LCHTF) (to W.D.J.). R.C.H., H.Z., and A.L.G. were supported by LCHTF as well as Grants R21 AI063147 and R21 AI063147, L.C.O.L. was supported by CNPq, and A.S.A. was a FICTG trainee. Completion of this study contributed to the Ph.D. requirements of A.S.A. ↵2 A.S.A. and P.M.L. contributed equally to this work. ↵4 Abbreviations used in this paper: TB, tuberculosis; BAL, bronchoalveolar lavage; GEE, generalized estimating equation; HCW, healthcare worker; IL-1Rn, IL-1R antagonist; IRAK-M, IL-receptor-associated kinase M: NEMO, NF-κB essential modulator IκB kinase γ; NOS, NO synthase; OLD, other lung disease; SOCS, suppressor of cytokine signaling; TGF-βRI, TGF-β receptor type I; TGF-βRII, TGF-β receptor type II; IDO, indoleamine 2,3-dioxygenase. World Health Organization 2007. Global Tuberculosis Control: Surveillance, Planning, Financing World Health Organization, Geneva. Collins, H. L., S. H. Kaufmann. 2001. The many faces of host responses to tuberculosis. Immunology 103: 1-9. Ottenhoff, T. H., F. A. Verreck, M. A. Hoeve, E. van de Vosse. 2005. Control of human host immunity to mycobacteria. Tuberculosis 85: 53-64. Bellamy, R., C. Ruwende, T. Corrah, K. P. McAdam, H. C. Whittle, A. V. Hill. 1998. Assessment of the interleukin 1 gene cluster and other candidate gene polymorphisms in host susceptibility to tuberculosis. Tuber. Lung. Dis. 79: 83-89. Dlugovitzky, D., A. Torres-Morales, L. Rateni, M. A. Farroni, C. Largacha, O. Molteni, O. Bottasso. 1997. Circulating profile of Th1 and Th2 cytokines in tuberculosis patients with different degrees of pulmonary involvement. FEMS Immunol. Med. Microbiol. 18: 203-207. Raju, B., Y. Hoshino, I. Belitskaya-Ley, R. Dawson, S. Ress, J. A. Gold, R. Condos, R. Pine, S. Brown, A Nolan, et al 2008. Gene expression profiles of bronchoalveolar cells in pulmonary TB. Tuberculosis (Edinb.) 88: 39-51. Nicholson, S., G. Bonecini-Almeida, J. R. Lapa e Silva, C. Nathan, Q. W. Xie, R. Mumford, J. R. Weidner, J. Calaycay, J. Geng, N. Boechat, et al 1996. Inducible nitric oxide synthase in pulmonary alveolar macrophages from patients with tuberculosis. J. Exp. Med. 183: 2293-2302. Wang, C. H., C. Y. Liu, H. C. Lin, C. T. Yu, K. F. Chung, H. P. Kuo. 1998. Increased exhaled nitric oxide in active pulmonary tuberculosis due to inducible NO synthase upregulation in alveolar macrophages. Eur. Respir. J. 11: 809-815. Rich, E. A., M. Torres, E. Sada, C. K. Finegan, B. D. Hamilton, Z. Toossi. 1997. Mycobacterium tuberculosis (MTB)-stimulated production of nitric oxide by human alveolar macrophages and relationship of nitric oxide production to growth inhibition of MTB. Tuber. Lung Dis. 78: 247-255. Boussiotis, V. A., E. Y. Tsai, E. J. Yunis, S. Thim, J. C. Delgado, C. C. Dascher, A. Berezovskaya, D. Rousset, J. M. Reynes, A. E. Goldfeld. 2000. IL-10-producing T cells suppress immune responses in anergic tuberculosis patients. J. Clin. Invest. 105: 1317-1325. Toossi, Z., M. E. Kleinhenz, J. J. Ellner. 1986. Defective interleukin 2 production and responsiveness in human pulmonary tuberculosis. J. Exp. Med. 163: 1162-1172. Gorelik, L., R. A. Flavell. 2002. Transforming growth factor-β in T-cell biology. Nat. Rev. Immunol. 2: 46-53. Jacobs, M., N. Brown, N. Allie, R. Gulert, B. Ryffel. 2000. Increased resistance to mycobacterial infection in the absence of interleukin-10. Immunology 100: 494-501. Bonecini-Almeida, M. G., J. L. Ho, N. Boechat, R. C. Huard, S. Chitale, H. Doo, J. Geng, L. Rego, L. C. Lazzarini, A. L. Kritski, et al 2004. Down-modulation of lung immune responses by interleukin-10 and transforming growth factor β (TGF-β) and analysis of TGF-β receptors I and II in active tuberculosis. Infect. Immun. 72: 2628-2634. Cunha, F. Q., S. Moncada, F. Y. Liew. 1992. 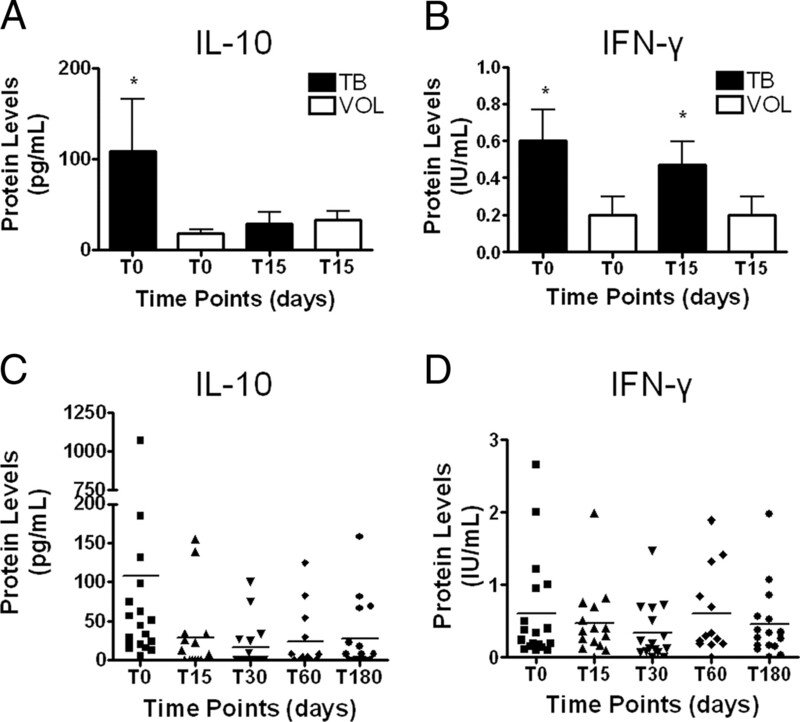 Interleukin-10 (IL-10) inhibits the induction of nitric oxide synthase by interferon-γ in murine macrophages. Biochem. Biophys. Res. Commun. 182: 1155-1159. Ding, A., C. F. Nathan, J. Graycar, R. Derynck, D. J. Stuehr, S. Srimal. 1990. Macrophage deactivating factor and transforming growth factors-β1, -β2, and -β3 inhibit induction of macrophage nitrogen oxide synthesis by IFN-γ. J. Immunol. 145: 940-944. Dinarello, C. A.. 2005. Blocking IL-1 in systemic inflammation. J. Exp. Med. 201: 1355-1359. Nambu, A., S. Nakae, Y. Iwakura. 2006. IL-1β, but not IL-1α, is required for antigen-specific T cell activation and the induction of local inflammation in the delayed-type hypersensitivity responses. Int. Immunol. 18: 701-712. Odemuyiwa, S. O., A. Ghahary, Y. Li, L. Puttagunta, J. E. Lee, S. Musat-Marcu, A. Ghahary, R. Moqbel. 2004. Cutting edge: human eosinophils regulate T cell subset selection through indoleamine 2,3-dioxygenase. J. Immunol. 173: 5909-5913. Mellor, A.. 2005. Indoleamine 2,3 dioxygenase and regulation of T cell immunity. Biochem. Biophys. Res. Commun. 338: 20-24. Mellor, A. L., D. H. Munn. 2004. IDO expression by dendritic cells: tolerance and tryptophan catabolism. Nat. Rev. Immunol. 4: 762-774.
van der Sluijs, K. F., M. Nijhuis, J. H. Levels, S. Florquin, A. L. Mellor, H. M. Jansen, T. van der Poll, R. Lutter. 2006. Influenza-induced expression of indoleamine 2,3-dioxygenase enhances interleukin-10 production and bacterial outgrowth during secondary pneumococcal pneumonia. J. Infect. Dis. 193: 214-222. Koh, W. L., M. L. Ng. 2005. Molecular mechanisms of West Nile virus pathogenesis in brain cell. Emerg. Infect. Dis. 11: 629-632. Yoshimura, A., T. Naka, M. Kubo. 2007. SOCS proteins, cytokine signaling and immune regulation. Nat. Rev. Immunol. 7: 454-465. Alexander, W. S., D. J. Hilton. 2004. The role of suppressors of cytokine signaling (SOCS) proteins in regulation of the immune response. Annu. Rev. Immunol. 22: 503-529. Imai, K., T. Kurita-Ochiai, K. Ochiai. 2003. Mycobacterium bovis bacillus Calmette-Guerin infection promotes SOCS induction and inhibits IFN-γ-stimulated JAK/STAT signaling in J774 macrophages. FEMS Immunol. Med. Microbiol. 39: 173-180. Nakayama, K., S. Okugawa, S. Yanagimoto, T. Kitazawa, K. Tsukada, M. Kawada, S. Kimura, K. Hirai, Y. Takagaki, Y. Ota. 2004. Involvement of IRAK-M in peptidoglycan-induced tolerance in macrophages. J. Biol. Chem. 279: 6629-6634. Moodley, Y. P., T. Dorasamy, S. Venketasamy, V. Naicker, U. G. Lalloo. 2000. Correlation of CD4:CD8 ratio and tumor necrosis factor (TNF) α levels in induced sputum with bronchoalveolar lavage fluid in pulmonary sarcoidosis. Thorax 55: 696-699. Henig, N. R., M. R. Tonelli, M. V. Pier, J. L. Burns, M. L. Aitken. 2001. Sputum induction as a research tool for sampling the airways of subjects with cystic fibrosis. Thorax 56: 306-311. Conde, M. B., A. C. Loivos, V. M. Rezende, S. L. Soares, F. C. Mello, A. L. Reingold, C. L. Daley, A. L. Kritski. 2003. Yield of sputum induction in the diagnosis of pleural tuberculosis. Am. J. Respir. Crit. Care Med. 167: 723-725. Bonecini-Almeida, M. G., S. Chitale, I. Boutsikakis, J. Geng, H. Doo, S. He, J. L. Ho. 1998. Induction of in vitro human macrophage anti-Mycobacterium tuberculosis activity: requirement for IFN-γ and primed lymphocytes. J. Immunol. 160: 4490-4499. Huard, R. C., S. Chitale, M. Leung, L. C. Lazzarini, H. Zhu, E. Shashkina, S. Laal, M. B. Conde, A. L. Kritski, J. T. Belisle, et al 2003. The Mycobacterium tuberculosis complex-restricted gene cfp32 encodes an expressed protein that is detectable in tuberculosis patients and is positively correlated with pulmonary interleukin-10. Infect. Immun. 71: 6871-6883. Freeman, G. H., J. H. Halton. 1951. Note on an exact treatment of contingency, goodness of fit and other problems of significance. Biometrika 38: 141-149. Verbeke, G., G. Molenberghs. 2000. Linear Mixed Models for Longitudinal Data Springer, New York. Diggle, P. J., P. Heagerty, K. Y. Liang, S. L. Zeger. 2002. The Analysis of Longitudinal Data 2nd Ed. Oxford University Press, Oxford. Sahiratmadja, E., B. Alisjahbana, T. de Boer, I. Adnan, A. Maya, H. Danusantoso, R. H. Nelwan, S. Marzuki, J. W. van der Meer, R. van Crevel, et al 2007. Dynamic changes in pro- and anti-inflammatory cytokine profiles and γ interferon receptor signaling integrity correlate with tuberculosis disease activity and response to curative treatment. Infect. Immun. 75: 820-829. Schwander, S. K., M. Torres, C. C. Carranza, D. Escobedo, M. Tary-Lehmann, P. Anderson, Z. Toossi, J. J. Ellner, E. A. Rich, E. Sada. 2000. Pulmonary mononuclear cell responses to antigens of Mycobacterium tuberculosis in healthy household contacts of patients with active tuberculosis and healthy controls from the community. J. Immunol. 165: 1479-1485. Taha, R. A., T. C. Kotsimbos, Y. L. Song, D. Menzies, Q. Hamid. 1997. IFN-γ and IL-12 are increased in active compared with inactive tuberculosis. Am. J. Respir. Crit. Care. Med. 155: 1135-1139. Grassi, M., M. Bocchino, A. Marruchella, E. Volpe, C. Saltini, V. Colizzi, F. Mariani. 2006. Transcriptional profile of the immune response in the lungs of patients with active tuberculosis. Clin. Immunol. 1201: 100-107. Weiner, H. L.. 2001. The mucosal milieu creates tolerogenic dendritic cells and TR1 and TH3 regulatory cells. Nat. Immunol. 2: 671-672. Zeller, J. C., A. Panoskaltsis-Mortari, W. J. Murphy, F. W. Ruscetti, S. Narula, M. G. Roncarolo, B. R. Blazar. 1999. Induction of CD4+ T cell alloantigen-specific hyporesponsiveness by IL-10 and TGF-β. J. Immunol. 163: 3684-3691. Hirsch, C. S., R. Hussain, Z. Toossi, G. Dawood, F. Shahid, J. J. Ellner. 1996. Cross-modulation by transforming growth factor β in human tuberculosis: suppression of antigen-driven blastogenesis and interferon γ production. Proc. Natl. Acad. Sci. USA 93: 3193-3198. Maeda, H., A. Shiraishi. 1996. TGF-β contributes to the shift toward Th2-type responses through direct and IL-10-mediated pathways in tumor-bearing mice. J. Immunol. 156: 73-78. Othieno, C., C. S. Hirsch, B. D. Hamilton, K. Wilkinson, J. J. Ellner, Z. Toossi. 1999. Interaction of Mycobacterium tuberculosis-induced transforming growth factor β1 and interleukin-10. Infect. Immun. 67: 5730-5735. Rojas, R. E., K. N. Balaji, A. Subramanian, W. H. Boom. 1999. Regulation of human CD4+ αβ T-cell-receptor-positive (TCR+) and γδ TCR+ T-cell responses to Mycobacterium tuberculosis by interleukin-10 and transforming growth factor β. Infect. Immun. 67: 6461-6472. Hirsch, C. S., J. J. Ellner, R. Blinkhorn, Z. Toossi. 1997. In vitro restoration of T cell responses in tuberculosis and augmentation of monocyte effector function against Mycobacterium tuberculosis by natural inhibitors of transforming growth factor β. Proc. Natl. Acad. Sci. USA 94: 3926-3931. Olobo, J. O., M. Geletu, A. Demissie, T. Eguale, K. Hiwot, G. Aderaye, S. Britton. 2001. Circulating TNF-α, TGF-β, and IL-10 in tuberculosis patients and healthy contacts. Scand. J. Immunol. 53: 85-91. Torres, M., T. Herrera, H. Villareal, E. A. Rich, E. Sada. 1998. Cytokine profiles for peripheral blood lymphocytes from patients with active pulmonary tuberculosis and healthy household contacts in response to the 30-kilodalton antigen of Mycobacterium tuberculosis. Infect. Immun. 66: 176-180. Fulton, S. A., J. V. Cross, Z. T. Toossi, W. H. Boom. 1998. Regulation of interleukin-12 by interleukin-10, transforming growth factor-β, tumor necrosis factor-α, and interferon-γ in human monocytes infected with Mycobacterium tuberculosis H37Ra. J. Infect. Dis. 178: 1105-1114. Hirsch, C. S., T. Yoneda, L. Averill, J. J. Ellner, Z. Toossi. 1994. Enhancement of intracellular growth of Mycobacterium tuberculosis in human monocytes by transforming growth factor-β1. J. Infect. Dis. 170: 1229-1237. Cho, M. L., J. W. Kang, Y. M. Moon, H. J. Nam, J. Y. Jhun, S. B. Heo, H. T. Jin, S. Y. Min, J. H. Ju, K. S. Park, et al 2006. STAT3 and NF-κB signal pathway is required for IL-23-mediated IL-17 production in spontaneous arthritis animal model IL-1 receptor antagonist-deficient mice. J. Immunol. 176: 5652-5661. Juffermans, N. P., A. Verbon, J. T. Belisle, P. J. Hill, P. Speelman, S. J. van Deventer, T. van der Poll. 2000. Mycobacterial lipoarabinomannan induces an inflammatory response in the mouse lung: a role for interleukin-1. Am. J. Respir. Crit. Care. Med. 162: 486-489. Chaussabel, D., R. T. Semnani, M. A. McDowell, D. Sacks, A. Sher, T. B. Nutman. 2003. Unique gene expression profiles of human macrophages and dendritic cells to phylogenetically distinct parasites. Blood 102: 672-681. Vijayakrishnan, L., K. Natarajan, V. Manivel, S. Raisuddin, K. V. Rao. 2000. B cell responses to a peptide epitope. IX. The kinetics of antigen binding differentially regulates costimulatory capacity of activated B cells. J. Immunol. 164: 5605-5614. Balkhi, M. Y., V. K. Latchumanan, B. Singh, P. Sharma, K. Natarajan. 2004. Cross-regulation of CD86 by CD80 differentially regulates T helper responses from Mycobacterium tuberculosis secretory antigen-activated dendritic cell subsets. J. Leukocyte. Biol. 75: 874-883. Balkhi, M. Y., A. Sinha, K. Natarajan. 2004. Dominance of CD86, transforming growth factor-β1, and interleukin-10 in Mycobacterium tuberculosis secretory antigen-activated dendritic cells regulates T helper 1 responses to mycobacterial antigens. J. Infect. Dis. 189: 1598-1609. Manca, C., L. Tsenova, S. Freeman, A. K. Barczak, M. Tovey, P. J. Murray, C. Barry, G. Kaplan. 2005. Hypervirulent M. tuberculosis W/Beijing strains upregulate type I IFNs and increase expression of negative regulators of the Jak-Stat pathway. J. Interferon Cytokine Res. 25: 694-701. Chong, M. M., D. Metcalf, E. Jamieson, W. S. Alexander, T. W. Kay. 2005. Suppressor of cytokine signaling-1 in T cells and macrophages is critical for preventing lethal inflammation. Blood 106: 1668-1675. Seki, Y., H. Inoue, N. Nagata, K. Hayashi, S. Fukuyama, K. Matsumoto, O. Komine, S. Hamano, K. Himeno, K. Inagaki-Ohara, et al 2003. SOCS-3 regulates onset and maintenance of TH2-mediated allergic responses. Nat. Med. 9: 1047-1054. Bafica, A., C. A. Scanga, C. G. Feng, C. Leifer, A. Cheever, A. Sher. 2005. TLR9 regulates Th1 responses and cooperates with TLR2 in mediating optimal resistance to Mycobacterium tuberculosis. J. Exp. Med. 202: 1715-1724. Reiling, N., C. Holscher, A. Fehrenbach, S. Kroger, C. J. Kirschning, S. Goyert, S. Ehlers. 2002. Cutting edge: Toll-like receptor (TLR)2- and TLR4-mediated pathogen recognition in resistance to airborne infection with Mycobacterium tuberculosis. J. Immunol. 169: 3480-3484. Abel, B., N. Thieblemont, V. J. Quesniaux, N. Brown, J. Mpagi, K. Miyake, F. Bihl, B. Ryffel. 2002. Toll-like receptor 4 expression is required to control chronic Mycobacterium tuberculosis infection in mice. J. Immunol. 169: 3155-3162. Noss, E. H., R. K. Pai, T. J. Sellati, J. D. Radolf, J. Belisle, D. T. Golenbock, W. H. Boom, C. V. Harding. 2001. Toll-like receptor 2-dependent inhibition of macrophage class II MHC expression and antigen processing by 19-kDa lipoprotein of Mycobacterium tuberculosis. J. Immunol. 167: 910-918. Re, F., J. L. Strominger. 2001. Toll-like receptor 2 (TLR2) and TLR4 differentially activate human dendritic cells. J. Biol. Chem. 276: 37692-37699. Salgame, P.. 2005. Host innate and Th1 responses and the bacterial factors that control Mycobacterium tuberculosis infection. Curr. Opin. Immunol. 17: 374-380. Moss, W. J., M. O. Ota, D. E. Griffin. 2004. Measles: immune suppression and immune responses. Int. J. Biochem. Cell Biol. 36: 1380-1385. Kerdiles, Y. M., C. I. Sellin, J. Druelle, B. Horvat. 2006. Immunosuppression caused by measles virus: role of viral proteins. Rev. Med. Virol. 16: 49-63. Verver, S., R. M. Warren, N. Beyers, M. Richardson, G. D. van der Spuy, M. W. Borgdorff, D. A. Enarson, M. A. Behr, P. D. van Helden. 2005. Rate of reinfection tuberculosis after successful treatment is higher than rate of new tuberculosis. Am. J. Respir. Crit. Care Med. 171: 1430-1435. Perrin, F. M., M. C. Lipman, T. D. McHugh, S. H. Gillespie. 2007. Biomarkers of treatment response in clinical trials of novel antituberculosis agents. Lancet Infect. Dis. 7: 481-490. Wallis, R. S.. 2007. Surrogate markers to assess new therapies for drug-resistant tuberculosis. Expert. Rev. Anti Infect. Ther. 5: 163-168.